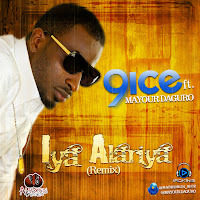 Abolore Adegbola Akande aka 9ice has just dropped a new single IYA ALARIYA Remix feat. Mayour Dagunro. Known for his sweet tongue, proverbial lyrics and unique style of bringing in ethnic flavor, this track is nothing short of that sweet Afrocentric tune we all know 9ice for and a lil bit of the Hip-hop flavor coming from Mayour Dagunro.